Prosthetic joint infections may lead to failures of total joint arthroplasty. Radionuclide imaging can play a diagnostic role in identifying such infections, which require two-stage exchange arthroplasty (instead of simple revision surgery performed in non-infected cases). Although 18F-FDG PET/CT has emerged as a novel diagnostic tool in this setting, the clinical usefulness of 68Ga-citrate PET/CT has not been previously investigated. This single-center prospective study was designed to address this issue. Between January 2016 and October 2017, we examined 34 patients with clinically proven or suspected prosthetic hip/knee joint infections scheduled to undergo surgery. All patients underwent 68Ga-citrate PET/CT scans and sequential 18F-FDG PET/CT imaging for comparative purposes. Intraoperative findings and the results of microbiological analyses of surgical specimens served as gold standard. The diagnostic results were examined according to (1) image interpretation based on radiotracer uptake patterns and (2) quantitative analysis using volumes of interest (VOIs) to calculate standard uptake values (SUVs) and metabolic volumes (MVs). A total of 26 (76%) patients were diagnosed as having infections. Based on radiotracer uptake pattern criteria, the sensitivity, specificity, and accuracy of 68Ga-citrate PET/CT and 18F-FDG PET/CT were 92%, 88%, and 91% and 100%, 38%, and 85%, respectively. MV was significantly higher in the infected group when 68Ga-citrate PET/CT was used (422.45 vs. 303.65 cm3, p = 0.027), whereas no significant differences were observed on 18F-FDG PET/CT. According to receiver operating characteristic (ROC) curve analysis, a cut-off value of 370.86 for MV resulted in a sensitivity of 61.5% and a specificity of 87.5% (area under curve: 0.75, 95% confidence interval: 0.57–0.88, p = 0.035). Subject to future confirmation, our data provide preliminary evidence that 68Ga-citrate PET/CT may have a complimentary role to 18F-FDG PET/CT in detecting prosthetic joint infections, being characterized by a higher specificity and the possibility to discriminate between an infectious condition and sterile inflammation. This prospective study was registered at clinicaltrials.gov (registration number: NCT02855190). Total joint arthroplasty is one of most frequently performed and successful surgical procedures in orthopedics . However, between 0.4 and 4% of all joint replacement procedures ultimately develop infectious complications, with a 2–18% of cases showing aseptic loosening . Numerous conventional nuclear medicine techniques have been investigated as imaging tools to discriminate between an infectious condition and sterile inflammation—including technetium-99m methylene diphosphonate (MDP) bone scintigraphy (BS), gallium (Ga)-67 citrate scans, and indium-111 or technetium-99m hexamethylpropylene amine oxime (HMPAO)-labeled white blood cell (WBC) scans . However, each of these techniques has significant limitations, including (1) the lack of specificity typical of BS and Ga-67 citrate scans, (2) the suboptimal imaging characteristics of all conventional two-dimensional examinations, (3) the potentially hazardous preparation of radiopharmaceuticals required by WBC scans, (4) the prolonged physical and biological half-life of indium-111- or Ga-67-labeled agents (resulting in a high absorbed radiation dose), and (5) the need of combining different traditional scanning techniques to obtain reliable diagnostic results. All of these caveats ultimately prevent their routine clinical use [4–7]. 18F-fluoro-2-deoxyglucose positron emission tomography/computed tomography (18F-FDG PET/CT) is increasingly emerging as a useful diagnostic tool for several infectious and inflammatory conditions—especially in patients with chronic renal failure or in those who had undergone metal prosthesis implantation [8, 9]. Previous studies have shown that 18F-FDG PET imaging has a pooled sensitivity of 82.1–82.8% and a specificity of 86.6–87.3% for the diagnosis of lower limb prosthetic joint infections [10, 11]. In this setting, 18F-FDG PET imaging may also offer significant advantages over conventional nuclear medicine examinations (which not only are more complex and expensive but also potentially limited by safety issues) . 68Gallium (68Ga) is a positron-emitting isotope that has been previously used for PET imaging. Intriguingly, preliminary data on the potential usefulness of 68Ga-citrate PET for identifying patients with bone infections have been promising . In a head-to-head comparison, 18F-FDG PET/CT has been superior to 68Ga-citrate PET/CT for diagnosing inflammatory reactions elicited by metal debris . However, the question as to whether 68Ga-citrate PET/CT is either superior or may offer complimentary information to 18F-FDG PET/CT in detecting lower limb prosthesis infections remains open. This prospective study was designed to address this research question. This study had a prospective design. The protocol complied with the tenets of the Declaration of Helsinki, was approved by the Institutional Review Board of the Chang Gung Memorial Hospital (CGMH) at Linkou (approval number: 103-7266A), and was registered at clinicaltrials.gov (NCT02855190). All patients gave their written informed consent. All data were securely protected (by delinking personal information from the main data sets), made available to investigators only, and analyzed anonymously. 68Ga was obtained using a 68Ge/68Ga generator (ITG Isotope Technologies Garching GmbH, Garching, Germany) which was eluted with 2.5 ml of 0.05 mol/l hydrogen chloride (HCl) solution into a 20-ml sterile vial—which contained 2.5 ml of sterile sodium citrate (27 mg/ml) solution, and 5 ml of sterile injection water. The 68Ga sodium citrate solution was subsequently transferred into the product vial through a sterile filter. The radiochemical purity of 68Ga-citrate was analyzed with an instant thin layer chromatography-silica-gel technique using methanol/acetic acid (9:1) as the mobile phase. The product pH was tested using indicator strips (pH range, 4.0–10.0), whereas the integrity of sterile filters was assessed with a bubble point test. The 68Ga-citrate used in this study was characterized by (1) high radiochemical purity (≥ 97%), (2) a pH of 4.5–8.0, and (3) a strength ≥ 11.1 MBq/ml. Between January 2016 and October 2017, a total of 39 patients were deemed eligible for the study. Inclusion criteria were as follows: (1) clinically proven or suspected periprosthetic hip/knee joint infections and (2) scheduled surgery. Patients were excluded if they met one of the following criteria: (1) pregnancy or breastfeeding, (2) significantly abnormal laboratory findings, and (3) critical illnesses or unstable vital signs that made the patient unsuitable for imaging and surgical work-ups. Four patients were excluded during the screening period, whereas one additional patient who completed the requested imaging studies did not ultimately undergo surgery. After these exclusions, 34 patients were retained in the analysis. All of the study participants were followed up for at least 6 months. All of the patients underwent sequential 68Ga-citrate PET/CT and 18F-FDG PET/CT imaging performed within less than 1 week of each other. The order of the two scans was not predetermined. The injection dose was 111–185 MBq for 68Ga-citrate and 5.18 MBq per kilogram of body weight for 18F-FDG. Patients were required to fast for at least 4 h before injection of both radiotracers. Images were obtained 60 min after intravenous administration of each tracer via a Biograph mCT PET/CT system (Siemens Healthineers, Erlangen, Germany). Patients were scanned from the iliac crest to the toe. CT scanning parameters for 68Ga-citrate and 18F-FDG examinations were 120 kV; 0.5 s per rotation; collimation, 40 × 0.6; pitch, 1.5; quality reference mAs with CAREDose 4D, 100 mAs; and slice thickness, 5 mm. PET acquisition time per bed position was 3 min for 68Ga-citrate and 1.5 min for 18F-FDG. All of the images were reconstructed using ultra-HD reconstruction with time of flight (2 iterations and 21 subsets), a 200 × 200 image matrix, and a 3-mm full width at half maximum (FWHM) Gaussian filter. In all cases, image interpretation was performed before surgery. All of the PET images were CT attenuation-corrected. The criterion for defining an examination as positive was the presence of an abnormal radiotracer uptake located at the bone-prosthesis interface and/or periprosthetic soft tissue . However, tracer uptake limited to soft tissues adjacent to the neck of the hip prosthesis was not considered sufficient to classify a scan as positive [15, 16]. Two observers (J.R.T. and T.C.Y. )—who were blinded to clinical data—jointly interpreted all images (including companion CT findings) and reached a diagnostic consensus through discussion. According to the definitions proposed by the Musculoskeletal Infection Society , the final diagnosis was based on intraoperative findings and microbiological evaluations of surgical specimens. For each 18F-FDG and 68Ga-citrate image slide, a volume of interest (VOI) was manually drawn by an experienced nuclear medicine physician (J.R.T.) around the bone-prosthesis interface or periprosthetic soft tissue. To this aim, the PMOD 3.3 software package (PMOD Technologies Ltd., Zurich, Switzerland) was used. The standardized uptake value (SUV) was calculated as follows: SUV = (tissue radioactivity [Bq/ml])/(injected radioactivity [Bq]/body weight [g]). Maximum SUV (SUVmax), mean SUV (SUVmean), and metabolic volume (MV) were subsequently calculated. The MV was defined as the number of voxel located inside the VOIs multiplied by voxel size. In this study, VOIs covered the entire bone-prosthesis interface as well as periprosthetic soft tissue (after the exclusion of vascular radioactivity). The isocontour was set at 20% of the maximum uptake observed within the corresponding focus. Based on an expected prevalence of confirmed infection of 75%, we initially planned to enroll 40 patients (resulting in a total of 30 patients with confirmed infection). However, recruitment was stopped at 39 cases because of a higher than expected incidence of cases with confirmed infections. The general characteristics of the study participants were summarized using descriptive statistics. Continuous data were expressed as medians and ranges and compared with the Mann-Whitney U test. Categorical variables were summarized as frequency counts and percentages. A 2 × 2 contingency table with four diagnostic outcomes (true positive, false positive, true negative, and false negative) was constructed based on the final diagnostic results. Receiver operating characteristic (ROC) curve analysis was applied to investigate the prediction accuracy. Optimal cut-off points that maximized prediction were identified using the Youden’s index. All calculations were performed using the SPSS software (version 22.0; IBM, Armonk, NY, USA). A two-tailed p value < 0.05 was considered statistically significant. Table 1 shows the baseline characteristics of the study participants. Nineteen (56%) patients were male, and the median age was 64 years (range 31–86 years). Hypertension and diabetes were the most frequent comorbidities, accounting for 14 (41%) and 8 (23%) cases, respectively. Osteoarthritis was the most common underlying condition that required total joint arthroplasty. A total of 19 (56%) patients received hip arthroplasty, whereas 8 (23%) cases underwent contralateral prosthesis replacement as well. Five (15%) patients required a second debridement of the infected tissue during the follow-up period (median interval 60 days, range 20–120 days). The median interval between the last PET/CT scan and the collection of surgical specimens was 9 days (range 1–26 days). A total of 19 (57.6%) patients had a positive bacterial culture (Staphylococcus aureus, n = 6; Staphylococcus epidermidis, n = 4; and Staphylococcus caprae, n = 2). Pseudomonas aeruginosa, Cellulosimicrobium cellulans, Enterococcus faecalis, Streptococcus dysgalactiae, and Staphylococcus lugdunensis were isolated only in one case each. Two patients were positive for two or more bacteria. Specifically, one was positive for both Staphylococcus aureus and Staphylococcus lugdunensis, whereas the other was positive for four bacteria (Staphylococcus aureus, group B streptococcus, Enterococcus faecalis, and Gemella morbillorum). Table 2 depicts the diagnostic characteristics of 68Ga-citrate PET/CT and 18F-FDG PET/CT scans, which are provided in Figs. 1, 2, 3, and 4. A total of 34 prostheses were examined in the study (19 hip prostheses and 15 knee prostheses). Infections were diagnosed in 26 (76%) patients. According to the radiotracer uptake pattern criteria, the number of true positive, true negative, false positive, false negative patients was 24, 7, 1, 2 for 68Ga-citrate PET/CT and 26, 3, 5, 0 for 18F-FDG PET/CT, respectively. There were five false positive cases on 18F-FDG PET/CT, four of which were considered as true negative on 68Ga-citrate PET/CT (cases # 4, 10, 16, and 24). The sensitivity, specificity, and accuracy of 68Ga-citrate PET/CT and 18F-FDG PET/CT scans were 92%, 88%, and 91% and 100%, 38%, and 85%, respectively (Table 3). The median (range) SUVmean, SUVmax, and MV values for the prostheses under examination were 0.99 (0.26–2.33), 4.20 (0.97–8.25), and 370.86 (147.18–817.00) on 68Ga-citrate PET/CT scans, respectively, and 1.89 (0.80–3.78), 7.36 (2.38–16.61), and 544.51 (259.58–1212.13) on 18F-FDG PET/CT scans, respectively. The SUVmean, SUVmax, and MV values observed on 18F-FDG PET/CT images were all significantly higher than those measured on 68Ga-citrate PET/CT scans (p < 0.001). In 68Ga-citrate PET/CT scans, the MV of infected prostheses was significantly higher than that observed for non-infected prostheses (mean ± SD: 422.45 ± 133.87 vs. 303.65 ± 96.39, respectively, p = 0.027). However, all of the other measured values did not differ significantly between infected and non-infected prostheses on either 68Ga-citrate PET/CT or 18F-FDG PET/CT scans (Fig. 5). According to receiver operating characteristic (ROC) curve analysis, a cut-off value of 370.86 for MV resulted in a sensitivity of 61.5% and a specificity of 87.5% (area under curve 0.75, 95% confidence interval 0.57–0.88, p = 0.035). Data on the potential usefulness of 68Ga-citrate PET/CT imaging in detecting infected lower limb prostheses remain limited. Although 18F-FDG PET has been shown to be highly sensitive in this clinical setting, results on its specificity are less conclusive [18–20]. In the current prospective study, 68Ga-citrate PET/CT appeared superior to 18F-FDG PET/CT with respect to specificity (88% vs. 38%, respectively), being also successful in distinguishing between an infectious condition and sterile inflammation (Fig. 1). Non-specific 18F-FDG uptake can be persistently detected for several years following an arthroplasty . In a previous experimental study, an increased uptake of both 18F-FDG and 68Ga was identified in infected bones; however, only 18F-FDG accumulation occurred in healing bones free from infections . Owing to different properties and uptake mechanisms for the two radiotracers, we hypothesized that 68Ga may be superior to 18F-FDG in distinguishing between infectious conditions and non-specific sterile inflammation. Several mechanisms may potentially explain 68Ga-citrate accumulation in infectious foci, including (1) higher Ga extravasation to the extracellular compartment as a result of an increased inflammation-related capillary permeability, (2) binding of dissociated gallium ions to transferring followed by their subsequent sequestration in a highly stable state within an infectious site, (3) binding to bacterial siderophores and activated lactoferrin in neutrophils, and (4) macrophage phagocytosis [22–24]. In contrast, 18F-FDG allows the identification of inflammatory cells characterized by an increased glycolysis—ultimately serving as an “in vivo label” for activated inflammatory cells at sites of infection/inflammation . In a previous small cohort study that focused on 68Ga-citrate and 18F-FDG PET/CT in the detection of infectious foci , the use of 18F-FDG resulted in a higher target-to-background ratio and higher signals at soft tissue infectious sites. Similar results were observed in the head-to-head comparisons performed in the current study. The SUVmax, SUVmean, and MV values were all significantly higher for 18F-FDG PET/CT, which was also superior in diagnosing infections of the sinus tract or cold abscesses. 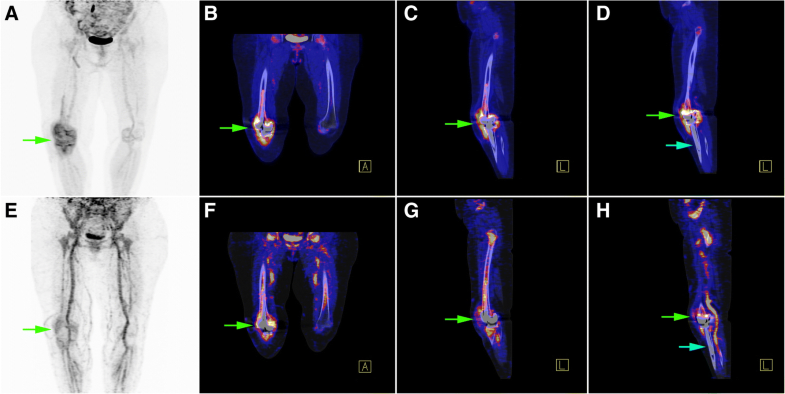 In contrast, 68Ga-citrate PET/CT was more effective in identifying the bone remodeling process related to fractures, bone unions, or osteolysis (Figs. 2 and 3). It is noteworthy that published studies have used different criteria for positive imaging findings, as well as various reference standards . In the current investigation, radiotracer uptake at the bone-prosthesis interface and/or periprosthetic soft tissue was the main criterion for positive results. We cannot exclude that this definition might have contributed to the high sensitivity and low specificity of 18F-FDG PET/CT observed in the current study. It should be also kept in mind that adverse reactions to metal debris can result in an increased 18F-FDG uptake that is indistinguishable from that occurring at foci of infection . In a previous study that used similar criteria for positive findings, the sensitivity and specificity for infected hip arthroplasties were 100% and 44.8%, respectively . Although the interpretation criteria were identical, the specificity of 68Ga-citrate PET/CT was markedly higher than that of 18F-FDG PET/CT (88% vs. 38%, respectively). Notably, 20 (58.8%) patients were identified based on the presence of 68Ga-citrate uptake in periprosthetic soft tissue. We therefore hypothesize that the high specificity of 68Ga-citrate PET/CT compared with 18F-FDG PET/CT is not directly linked to a soft tissue uptake underestimation (which should result in a lower likelihood of false positive results) but should rather be ascribed to the intrinsic characteristics of 68Ga-citrate. Previous studies have shown that 18F-FDG PET may be less accurate in detecting knee prosthesis infections [10, 27]. The question as to whether 68Ga-citrate PET/CT imaging can be sufficiently accurate even when the analysis is restricted to knee prostheses alone deserves further scrutiny. Several authors have maintained that the key to PET/CT diagnosis of prosthesis infections is mainly related to a specific uptake pattern (i.e., radiotracer localization in the bone-prosthesis interface) rather than to the intensity of uptake per se [11, 15]. Our current data lend further support to this prevalent view. Accordingly, SUVmean and SUVmax values did not differ significantly between the infected and non-infected groups on both 18F-FDG and 68Ga-citrate PET/CT imaging. However, we found significant differences in terms of MV on 68Ga-citrate PET/CT imaging between infected and non-infected prostheses (422.45 vs. 303.65, respectively, p = 0.027). The optimal cut-off value of 370.86 resulted in a sensitivity of 61.5% and specificity of 87.5%. Notably, only two non-infected cases were correctly identifiable beyond the MV range that overlapped with infected cases (Fig. 5). Further studies with larger sample sizes are required to confirm the clinical usefulness of MV quantification on 68Ga-citrate PET/CT scans and to further investigate the optimal cut-off value. Several limitations of our study merit comment. First, our results might not be generalizable owing to the limited sample size and the single-center nature of the study. Second, we did not specifically assess the impact of attenuation-corrected, non-attenuation-corrected, or other different imaging reconstruction methods, which may pose some issues in standalone PET scanners. Third, this study was not designed to evaluate the differences between different interpretation criteria proposed in the literature. Finally, the specificity of 18F-FDG PET/CT observed in our study was lower than that previously reported. Consequently, future studies should aim at validating the current data using consistent interpretation criteria and combined PET/CT scanners. Because diagnosis of prosthetic joint infections remains particularly challenging in the early postoperative period , we hypothesize that 68Ga-citrate PET/CT could serve as a complimentary diagnostic tool especially in patients with recently implanted prostheses. This study was financially supported by grants (CRRPG3E0031 and CRRPG3E0032) from the Chang Gung Memorial Hospital. The authors acknowledge the statistical assistance provided by the Clinical Trial Center, Chang Gung Memorial Hospital, Linkou, Taiwan (funded by the Ministry of Health and Welfare of Taiwan; grant MOHW107-TDU-B-212-123005). This study was financially supported by grants (CRRPG3E0031 and CRRPG3E0032) from the Chang Gung Memorial Hospital (CGMH). This study was based on datasets included in the published article. JRT, YHC, and TCY participated in the study design and drafted the manuscript; LYY was in charge of data analysis; CTW, SYC, and CHW were involved in data collection; ITH contributed to image analysis. All authors have read and approved the final version of the manuscript. This prospective study was performed in accordance with the 1964 Declaration of Helsinki and was approved by the Institutional Review Board of the Chang Gung Memorial Hospital (CGMH) at Linkou (approval number: 103-7266A). The study protocol was approved by the Institutional Review Board of the Chang Gung Memorial Hospital (CGMH) at Linkou.